Thanks to a tweet from the lovely Mr Matchett I fired off an email and was invited along to an evening with Phil Huckle, Chivas Regal brand ambassador, at the Attic Bar in the Pan Peninsula building. The plan was to taste through the three flagship Chivas Regal bottlings (12, 18 and 25 years old) as well as some of the Strathisla single malt that forms the core of the whisky. Unfortunately, due to a delivery mixup we got a case of Glenlivet rather than the Chivas 12, so no proper vertical tasting, but we did start on a whisky that I rather like. Chivas sits in the ‘premium’ blend category – still mass produced but made with finer whiskies than you’d find in the Teachers and Bells of this world. I found their story amusing, in a schadenfreude kind of way. In the mid 1800s the Chivas Brothers, James and John, had a posh grocers in Aberdeen and branched out into whisky blending (James moving from tea to whisky) in an attempt to make something smooth enough to replace cognac, which had recently been hit by phylloxera, wiping out a lot of production. It was popular and they started supplying the royal family. In 1909 the Chivas company produced a 25 year old blended whisky which they started selling successfully in the USA as the first premium scotch whisky, but the trail of woe then begun. In 1914 the first world war started, when that ended in 1919 prohibition started, shortly after that finished in 1932 the second world war begun, followed by the Wall Street crash and great depression. None of these things particularly helped the world of Chivas and the company started losing money. In 1950 they were bought up by Seagrams (for the knock down price of £80,500), who also bought Strathisla and some of the other components to ensure a continuity of supply. They relaunched Chivas Regal as a 12 year old blend shortly after, Frank Sinatra decided he liked it and off it shot into premium blend stardom. 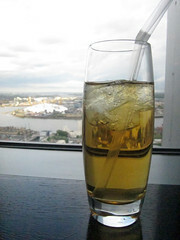 When we (Me, Chris and Alan) arrived we were presented with a cocktail by Phil – a classic mix of whisky (Chivas 18 in this case), cinnamon syrup and apple juice. A tasty cocktail, although the whisky didn’t real feel that integrated with the rest of the cocktail (and the 18 was a bit wasted on being mixed). We quickly moved (after a few photos on the balcony) on to the main part of the evening – the tasting. We started on the Glenlivet 12, which is nothing to do with Chivas other than also being owned by Pernod-Ricard. After the focus group I was at the other week I had more of an idea what to expect from the whisky. On the nose there was biscuits, flowers, olive oil, candy floss and tropical fruit. To taste it is less sweet than the nose suggests, with wood, more biscuits and berry fruits. A touch of water brings out more sweetness from the wood, adds vanilla, spice and a creamy mouth feel, all finished with a bitter woodiness. It’s the second best selling whisky in the world and while I’m not a fan of Glenfiddich (the best selling) I can see why this does so well – it’s easy to drink and solid. Nothing too special, but a good one. We then moved on to the core of the Chivas Regal 12 – Strathisla 12 year old single malt. Strathisla is a small distillery and almost all of their output goes into the Chivas blends, working as the core of the whiskies. On the nose it was quite light and savoury, with nuts and a touch of sweetness. To taste it had much more – hazelnuts, spice, burnt caramel and a background oiliness with a woody finish. It can take a slug of water, which opens the wood to creamy vanilla and floor polish, even more nuts and flowers. Strangely light on the nose, but quite a big bigger in body – a solid and tasty speyside whisky. We then got to try a non-production whisky- the Strathisla 18 year old single malt. It’s the core of the Chivas Regal 18 year old blend and as such doesnt get out of the distillery unless it’s in a Chivas bottle or going to a tasting. This was a chunk darker than the last one, coming in as a dark gold, and on the nose it had an appley sweetness, a touch of hazelnut and an oily end. To taste it was very light, much lighter than the 12. The wood had had much more of an effect, giving it a lightly spicy vanilla taste. A tiny drop of water brought out the creaminess that I’d expect with so much wood, along with more peary fruit and vanilla, but more than a drop swamped it. A delicate whisky that I’m surprised survives so well in a blend. 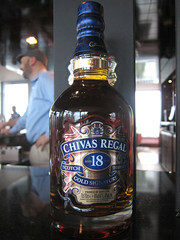 Now we came to the reasons behind the tasting, the Chivas blends – first up was the Chivas Regal 18. On the nose it’s got sour fruit (cherries? ), coffee and oaky vanilla. It had a very smooth taste, with lots of wood and vanilla, but not much else. A touch of water opened it up with the creamy mouthfeel of the Strathisla along with a touch of linseed oil, woody spice and a warming finish. It’s quite pleasant and I can see the intention – blending some good whisky together (with some cheaper, but still good quality grain whisky) to create a very easy drinking dram. It’s a bit light for my taste, but isn’t bad. 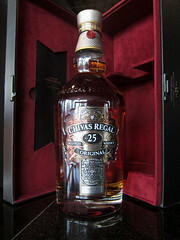 The final dram of the night was something a little special – the Chivas Regal 25. Not a recreation of the original 25 year old blend, as the recipe for that is long gone and there are no known surviving bottles, but the very limited edition that they only make a few thousand bottles of a year. The UKs allocation is only 360 this year and somehow 3 bottles managed to end up at our tasting. It had a really distinctive smell, with a strong scent of pears with a flowery perfume and a hint of butterscotch. To taste it was very delicate, with a creamy mouthfeel off the bat, spicy pears and cherries fading to a bitter dry wood finish. It didn’t need water, but with a drop there was more vanilla, apricots, the oiliness from the Strathisla and a peach stone bitterness to finish. A very elegant dram and very delicate with it. 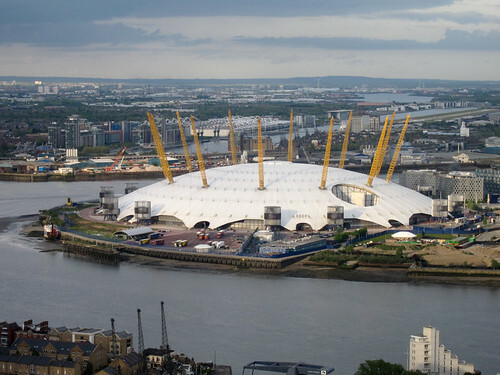 It was quite nice, but probably not something that I’d pay £200 for. All in all a much more interesting tasting than I was expecting from the description. I’ve tried the Chivas 12 and it’s always just come across as Just Another Blend (although I need to have another try now that I’ve realised that being snobby about blends is stupid), but the older whiskies were in a different league. 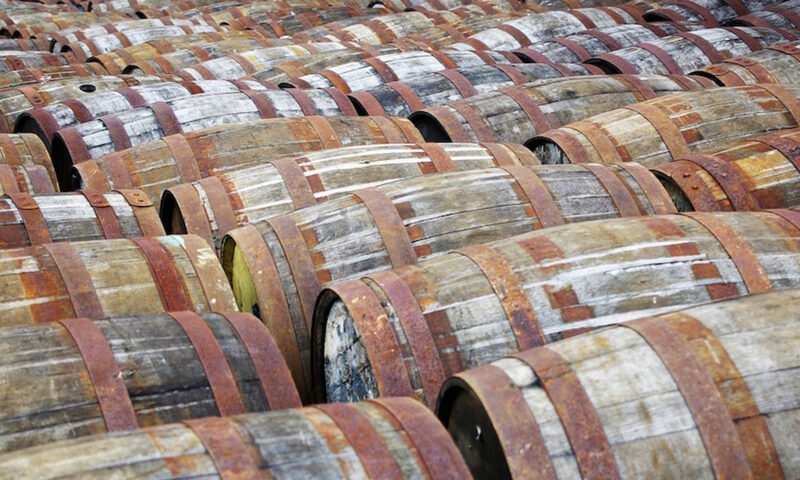 Strathisla has also gone on my ‘try again’ list and from reports the distillery tour is one for me to look out for next time I’m up in Scotland. A good night.